A Singaporean, Choo Waihong was a corporate lawyer with top law firms in Singapore and California before, in 2006, she left behind the fifteen hour days of corporate life to travel China. She lived for six years with the Mosuo tribe and now spends half the year with them in Yunnan. From the moment she stepped into the Kingdom of Women, Waihong was captivated. The Mosuos worship the female spirit, celebrate every aspect of womanhood and structure their social hierarchy according to maternal bloodlines. Their way of life was a stark contrast to the male-dominated world of law. Waihong became the first outsider to move into the heart of the tribe, where she stayed for six years. 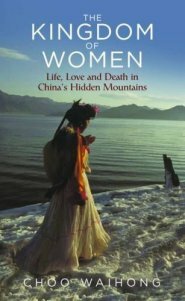 Raising important questions about gender roles and modern society, this is a unique, thought-provoking glimpse into a hidden way of life that teeters on the knife-edge of extinction in modern China.